The twelve colours of the Chromatics collection are available in convenient small ink cartridges, compatible with all Caran d'Ache fountain pens. There are 6 Chromatics ink cartridges per box. 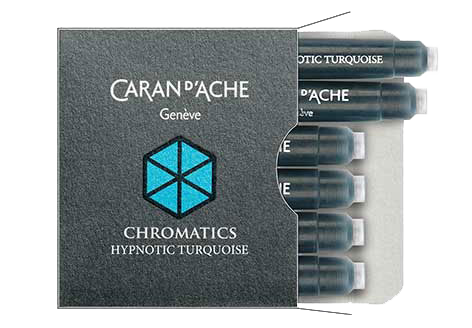 Each cartridge has been branded with the Caran d'Ache logo and the colour's name. There are 12 colours available: Cosmic Black, Delicate Green, Divine Pink, Electric Orange, Hypnotic Turquoise, Idyllic Blue, Infinite Grey, Infrared, Magnetic Blue, Organic Brown, Ultraviolet, and Vibrant Green.